In 2011, the Susanne Wenger Foundation in Krems was re-established with the support of the Lower Austrian provincial government and provincial governor Erwin Pröll in order to be re-inaugurated with an exhibition of Susanne Wenger’s works on 8 July 2011. The Susanne Wenger Foundation aims at keeping alive the artist’s heritage made up of her art and philosophy of life. That’s why it is important to register, document in detail and, where necessary, restore the artist’s works. Furthermore, the foundation aims at collecting any information about Susanne Wenger and at examining scattered works of art to gain a broad overview of her life and work. Equally momentous are her philosophical treatises, osmotic texts and the bundle of handwritten letters forming part of her legacy, which are to be archived. 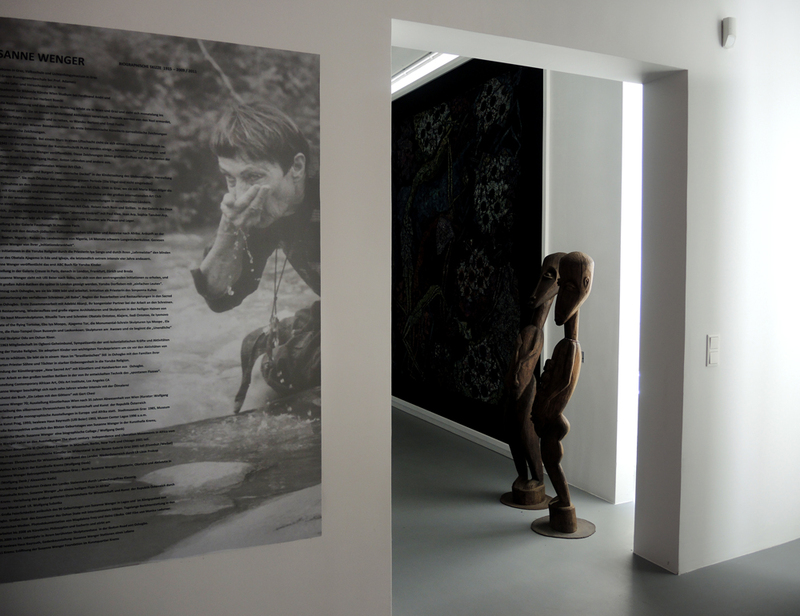 This contributes to making this exceptional artist’s life and work at a river in Africa accessible to a wider public. While the Susanne Wenger Foundation has no fixed opening hours, it can be visited by way of special guided tours for groups and during events. According to innumerable international reports on TV, film and the print-media Susanne Wenger, who was born in the town of Graz, Austria on the 4th of July 1915, became known as the “white priestess of a sacred riverside deep within Africa”. But she was much more than that, she was one of the most important artists of post war Austria and an outstanding artist in Africa. Because of her remote position, geographically as well as thematically, sensational stories published in Europe about her exotic and esoteric art after she moved away sometimes created misinterpretations about what she had done in Africa as an artist from Austria. She understood the philosophical message that the gods, the people and the African nature have for every human being and one side of her complex character eventually became Yoruba itself. She lived in Nigeria for nearly 60 years mostly in the now famous stone house in Ibokun Road, Oshogbo together with her so called “spiritual family”, where she also had her studio, supporting and supported by her ritually adopted children: chief-priestess Adedoyin Olosun and chief-priest and artist Shangodare G. Ajala. Until her death in Oshogbo at the age of ninety three on January 12th, 2009 she courageously defended all she had given to this Nigerian region and its people. 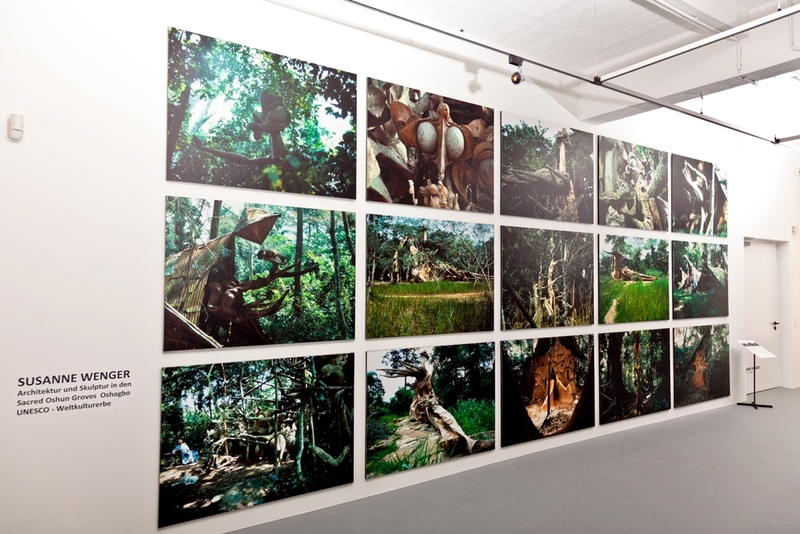 The Sacred Groves of Oshogbo in Nigeria and the works of art Susanne Wenger created could well be one of the seven miracles of the world. It all started in the 1950‘s when Susanne Wenger was called through the Ifa Oracle of the old high-priestess of Oshun, to help to restore the shrine of Idi Baba which by that time was in a sorry state of disrepair. A short time later she started work at Ojubo Oshogbo, the ancient principal temple of the river-goddess Oshun and the main shrine in the groves, which had nearly been destroyed by termites. Susanne Wenger’s works of art, her huge cement sculptures, daringly artificial and sometimes defying architectural rules, marvellous cult shrines, houses and caves of initiation and endless walls - all depicting the metaphysical - which she created sometimes in cooperation with a group of Yoruba artists, priests and workmen (whom she called “New Sacred Art”), became eternal reality. Through the guidance and the dynamics of working with Susanne Wenger many members of this group later became well known artists in their own right such as Adebisi Akanji, Buraihmoh Gbadamoshi, Kasali Akangbe, Ojewale Amoo, Rabiu Abesu, Saka, Alagbede Ajibike Ogun Ni’yi to name just a few. 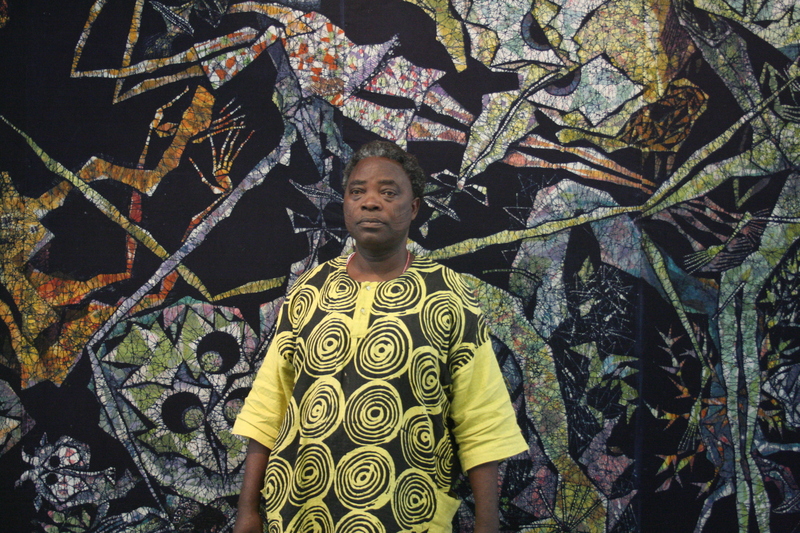 Chief Shangodare Gbadegesin Ajala became the speaker of the New Sacred Art movement. Adebisi Akanji was Susanne Wenger’s legendary co-builder, who worked with her on most of the monumental cement sculptures that the Sacred Groves are now famous for. Ojewale Amoo was the first to join the team, Saka crafted the spiritual Market Oja Ontotoo while Buraihmoh Gbadamoshi and Kasali Akangbe created most of the sculptures in wood and stone and are now professional sculptors of excellent reputation. 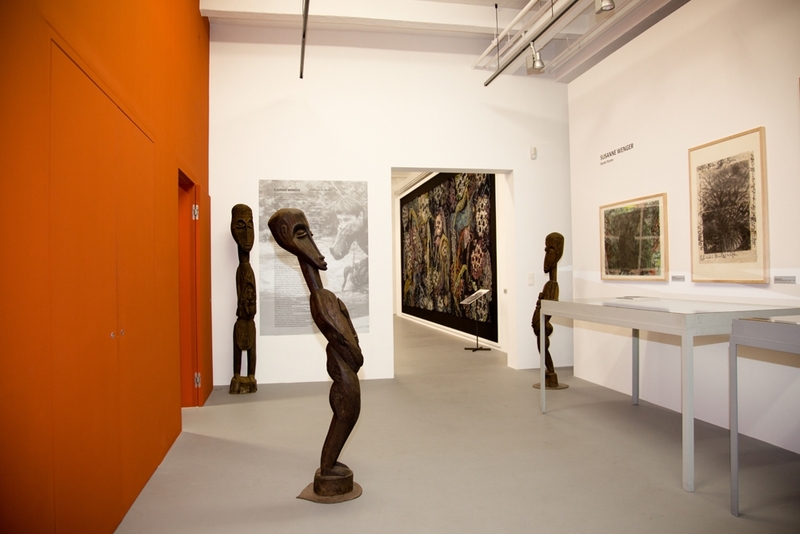 Susanne Wenger’s monumental sculptures and shrines, particularly the Obatala shrine, the Ogboni sculptured shrine “Iledi Ontotoo”, the statue of Obatala greeting, the statue of Alajere dancing for Oshun, the Chameleon fence of Ebu Iya Mopoo; the monumental figure shrines of Iya Mopoo, the grandiose “Alajere Transformation Sculpture” and the sky-high figure of Ela became world famous. The lost main entrance to Ojubo Oshogbo, the gate of “The Flying Tortoise” was one of her major works and might be rebuilt one day. Fifty years after she started her work, the Oshun Groves were declared a UNESCO world heritage site. And it will be up to the New Sacred Art Movement, founded by Susanne Wenger at first hand, to keep her heritage of sacred art in the Oshun Groves alive. During all these years, Susanne Wenger not only protected the natural paradise of the Oshun Groves with its mighty trees along the unspoilt bends of the sacred Oshun River, but also one of the most important spiritual centres for the Yoruba culture. Susanne Wenger, who was a well-known artist before she went to Nigeria, was one of the founding members of the famous international Art Club Vienna in 1946. She produced her first surrealistic drawings in 1943/44 after having had nightmares when the city of Vienna, where she was living at the time, was bombed in World War II. These drawings became important to a group of young Austrian artists who later became famous as “Vienna School of Fantastic Realism”. (Her hatred against the Hitler Party was one of the topics of the large exhibition “Artists in Dark Times” 2001 in Graz, her Austrian hometown). In 1949 she travelled to Italy , Switzerland and finally to Paris where she met Ulli Beier (who died early 2011), a linguist, whom she married and, surprising all her friends among the Austrian artists, she disappeared to the town of Ibadan in Nigeria. In 1953, Susanne Wenger published the first ever alphabet book for primary schools in Yoruba. In 1954 she still had exhibitions in Paris, London, Zurich and Brenda. In 1955 Susanne Wenger moved to the village of Ilobu with Ulli Beier, prior to them settling in Oshogbo, but still visiting Ede (where they had moved to from Ibadan) to participate in Obatala rituals and to rebuild the shrine for Obatala, until the death of the charismatic Obatala chief-priest Ajagemo, whom she called her great mentor. It was in Ilobu where she wanted to live in the circle of ordinary Yoruba village people and where she started to learn the ancient technique of Cassava batik called “Adire”. Susanne Wenger combined the „cubistic contemporary“ style of her Paris art experience with the storytelling traditional Yoruba patterns. Until she died, she was living and working in and around Oshogbo, now the capital of Oshun State a large town of over five hundred thousand inhabitants in the middle of Yoruba land. Initiated as Yoruba Olorisha Priestess, she was comprehensively fulfilled with the poetry, mythology and religion of the Yoruba people, without ever denying that she was a contemporary artist in every sense. The clear transcendent expression of her art comes out of religious thinking, spontaneous and free, as an expression of her universal understanding of art. Another outstanding example of her unique art are her textile-painted batiks. From the beginning of her work on the huge batiks she developed her own distinctive style, which she called „spontaneous flow “. After 1970, when most of the major works in the Oshun Groves were well under way, she felt that she should create an innovation of her roots as a trained artist and she started a revival of her oil painting with tremendous results. In 1982 her book “A Life with the Gods” was published, photographed by the great expert of African and World art Gerd Chesi. From 1985 on Prof. Wolfgang Denk curated monographic exhibitions of Susanne Wenger on behalf of the Austrian Government, bringing her back to Vienna to celebrate her seventieth birthday just across the square from where she had her studio forty years previously. She was decorated with the “Silver Order of Art and Science” by the Federal Republic of Austria in 2001 and the highest order of the Government of Lower Austria. In 1995, to celebrate Susanne Wenger’s eightieth birthday, her perhaps greatest exhibition took place in the Kunsthalle Krems, Austria in the deconsecrated church of the Minorites. 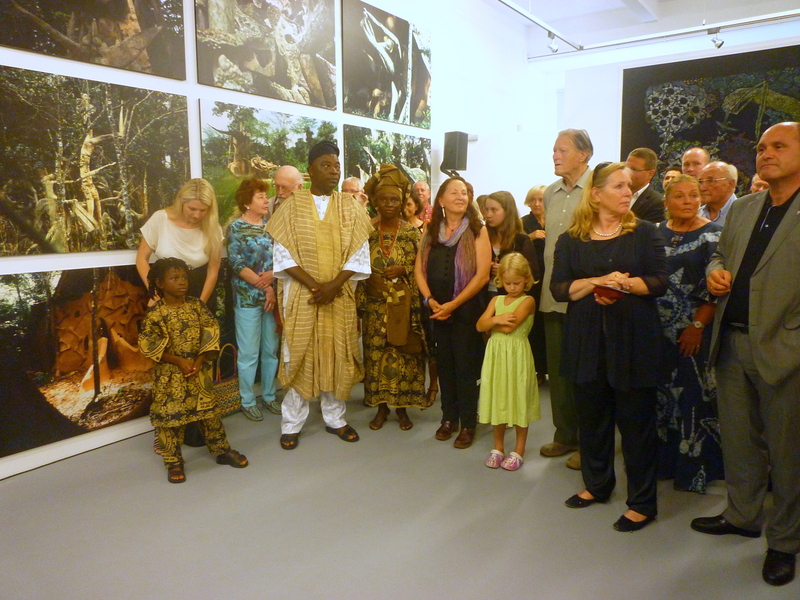 Several thousand visitors came to the opening, including the famous Ulli Beier, Nobel prize winner Wole Soyinka and a group of more than ten traditional Yoruba priests, dancers and drummers. Also that year Susanne Wenger established the Susanne Wenger Foundation to collect and support her art works in Krems, Austria. There were other large exhibitions of her work including those in her hometown of Graz in 1995 and 2004, Museum of Modern Art in Prague, Czechoslovakia, Ulli Beier’s Iwalewa Museum in Bayreuth Germany in 1993 and in the Muson Centre Lagos 1996. 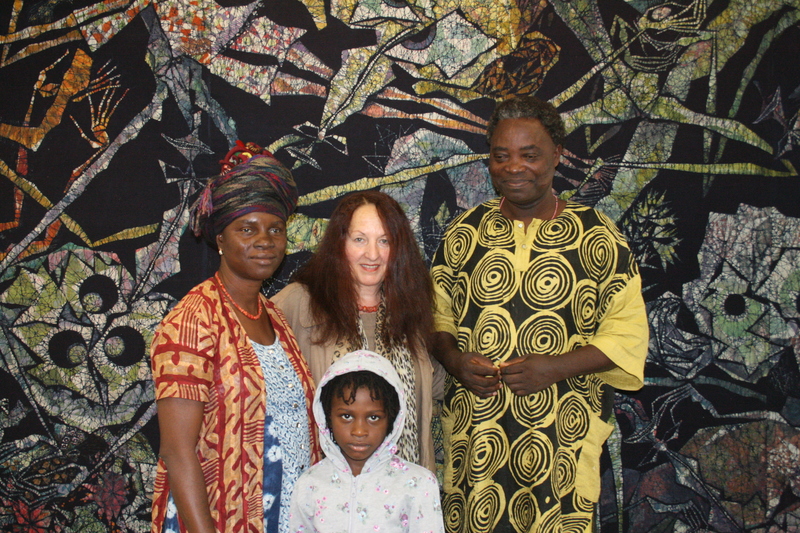 In 2001, Susanne Wenger was also invited to exhibit in the significant exhibition “The Short Century - Independence and Liberation Movements in Africa” which was curated by Okwui Envezor (the Nigerian curator of “documenta IX” in Germany, the most important exhibition circle of modern and contemporary art since in 1955). 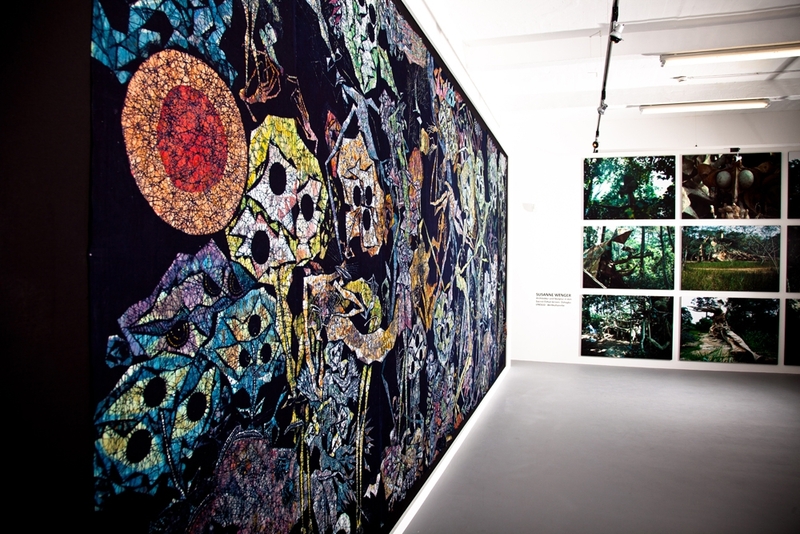 This exhibition was shown in Munich, Berlin, New York and the Modern Art Museum Chicago. In 2004 she was awarded with the highest decoration of her home state, Styria, by the State Governor and also received the “Golden Award of Art and Science” of the Federal Republic of Austria. 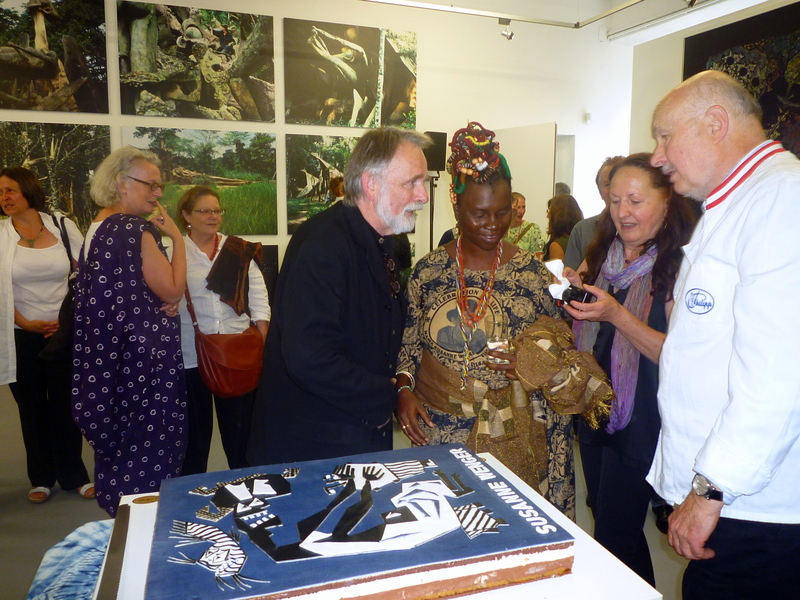 The Kunsthalle Krems (whose founding director was Prof.Wolfgang Denk) organised another anniversary exhibition under the title of: “Susanne Wenger - Artist and Priestess – along the Banks of a Sacred River in Africa”. In 2005, Susanne Wenger’s ninetieth birthday was celebrated extensively in Oshogbo and Lagos and large ceremonies were held in the Kings Palace of Oshogbo, in the Governor’s Palace and at her home in Ibokun Road Oshogbo. International guests where invited, a large number of traditional Yoruba priests of the highest order were present and even the Austrian National Television sent a team to cover the celebrations. There was extensive coverage in the Nigerian media and the Austrian Ambassador held a reception in his Lagos residence. In 2008 she was given the great honour to be declared a Member of the Order of the Federal Republic by the Nigerian Government. 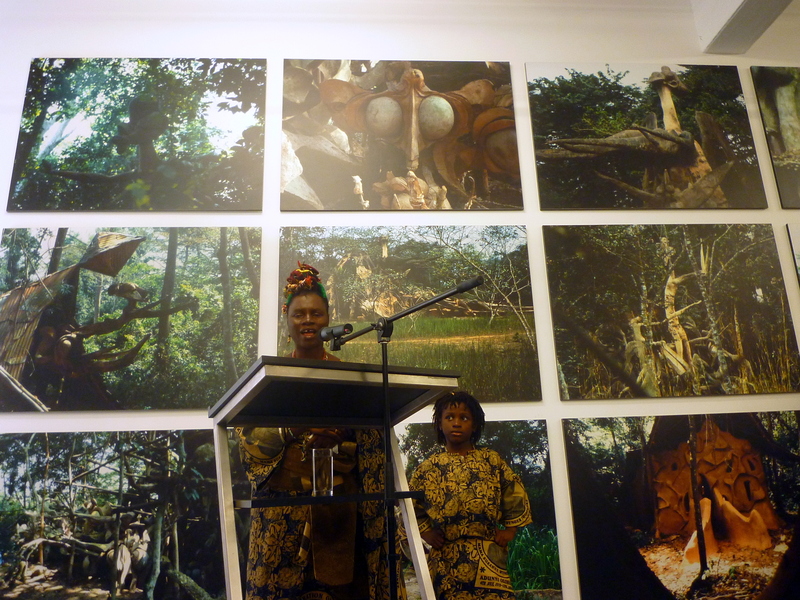 Throughout all these years since 1985, Susanne Wenger kept on working together with her people in the Oshun Groves, which in the meantime had been declared a National Monument of Nigeria. The annual Oshun Festival in the Sacred Groves of Oshogbo is the most important traditional religious Festival of Africa, attracting thousands of visitors and worshippers. She was continuing her work at the most complex Odu sculpture at a hidden place in the Oshun groves and also painting and drawing in her studio. 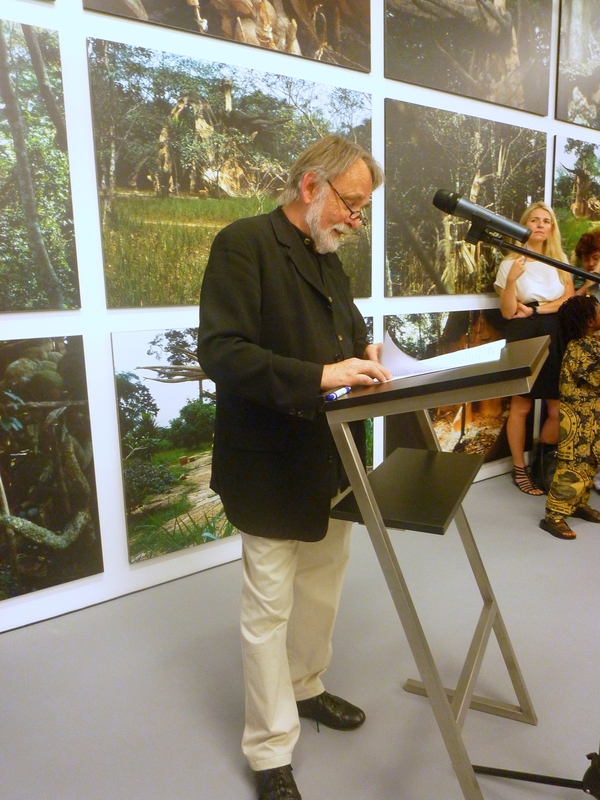 Wolfgang Denk travelled many times from Austria to Oshogbo and Susanne Wenger visited Austria almost every year and stayed in his home and studio with him and his wife Martha, who became her special confidante. In Oshogbo, after her sad passing away, Susanne Wenger was buried in her beloved Oshun Groves, and important ceremonies where held then and are still being held. Her spiritual family is taking care of the legacy of Adunni Olorisha (Susanne’s Yoruba name), mother and guardian of Yoruba traditions and religions. 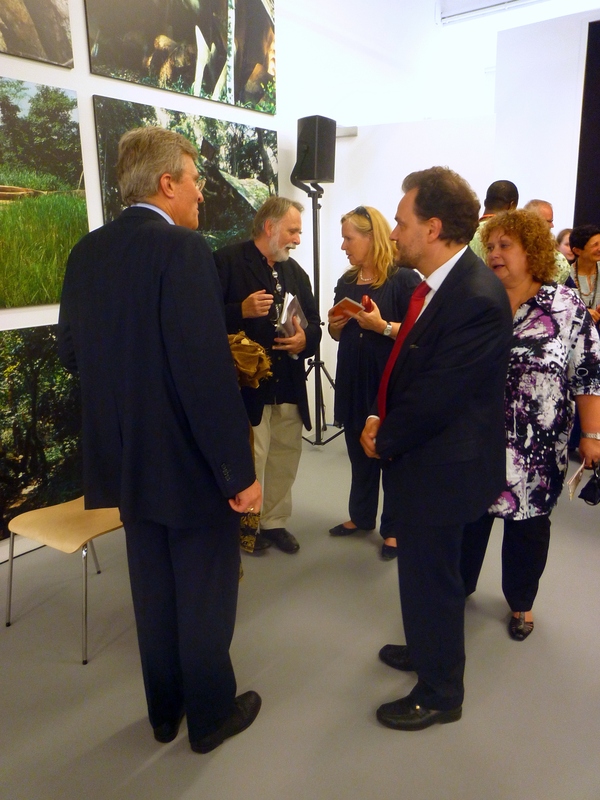 The Susanne Wenger Foundation in Krems has been re-established with the support of the Lower Austrian Government under the Leadership of Governor Dr. Erwin Proell and opened with an exhibition of her work on the 8th of July 2011. The purpose of the Susanne Wenger Foundation is to keep her heritage, consisting of her art and her life philosophy, alive. It is vital to collect, restore and save as much about her life as possible and provide the basis for research. 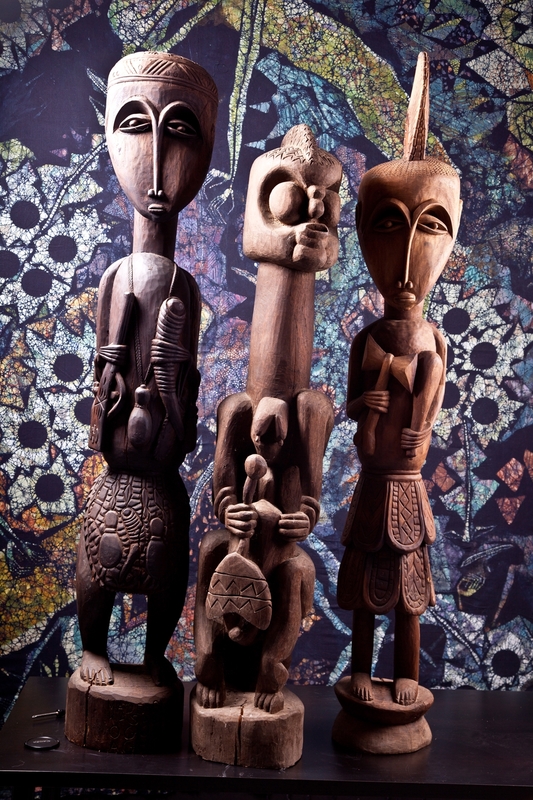 Susanne Wenger’s philosophy - about all nature as one, being part of something spiritual, the spirit of Art and the spirit of Religion as manifested in the Sacred Groves of Oshogbo. The late Susanne Wenger, the unforgettable and outstanding Artist and Philosopher, liked to state: “Our works are maybe just leaves of the tree of life, given to the Logos, which is the sacred centre of the universe and the origin of all life.